Manager Derek Adams says Plymouth Argyle wore their away kit in Tuesday's home defeat by Blackpool to please fans, not because their home strip clashes with the green seats or grass. 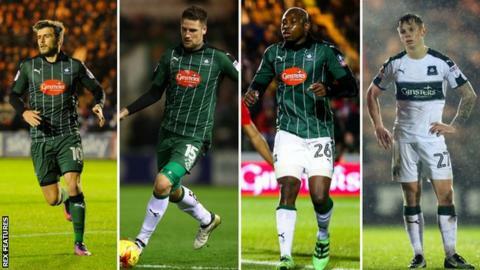 The Pilgrims have lost six league games at Home Park this season, including all four they have played on Tuesdays. EFL rules allow clubs to change their kit for one home game each season. Before the match, Adams said: "A number of fans don't get to see the away kit, and it's a fitting night to do it." Argyle were beaten 3-0 by the Seasiders, making it six home Tuesday League Two games without victory - a winless run that stretches back to last season. The Devon side, second in League Two, started the campaign wearing their official all green strip, but have worn white socks and shorts in recent home games. Speaking before their defeat by Notts County on 28 February, 41-year-old Adams said there had been issues with Plymouth's home colours. "We have changed the kit about a bit - had white shorts and white socks because of the reason that the kit is too dark," he told BBC Radio Devon. "It blends in with the seating and it blends in with the grass, and that's the reason we have changed it for a number of home games this season." However, after the Blackpool game Adams said the kit change was a spontaneous decision and did not affect the result. "There was no reason, it's just that tonight was the night we were going to do it," he added.